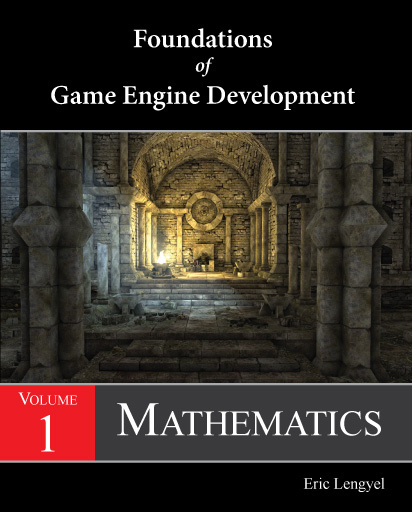 This is the errata page for the Foundations of Game Engine Development book series. Corrections are listed by volume and printing. To find out which printing you have, look on the copyright page of each volume. Errors listed for any particular printing also appear in earlier printings, but were corrected in all later printings. There are no known errors in the fourth printing. Page 21. The end of the sentence preceding Equation (1.33) should read “then the dot product can also be expressed as”. Page 18. The third line following Equation (1.28) should begin with “v = (0,0,1)”. Page 21. In the caption for Listing 1.6, the listing number should be set in bold type. Page 45. In the paragraph that begins with “Steps A and B are called pivoting”, the fourth line should read “by choosing the largest entry in each column because this causes the scalar factors”. Page 65. In Equation (2.23), all of the off-diagonal elements in the left matrix should be negated. For example, the (0,1) and (1,0) entries should both be −axay.